While a standard chain link fence may be enough to keep out unwanted guests, both human and animal, adding barbed wire offers additional security. If you have a preexisting chain link fence and want to beef up your home security, design and purchase a barbed wire kit and install it yourself. You can find the materials you need to protect yourself and your home online and at many hardware stores. 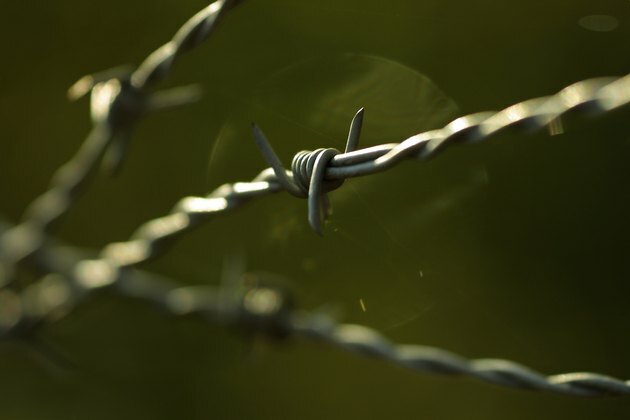 Barbed wire adds additional security to fences. Slide the barbed wire post extensions onto the existing corner posts of your chain link fence. These extensions always come with screws for securing the additional posts to the ones on your fence. If your fence's corner posts don't have holes for these, you will need to use a drill to secure the extensions. Examine the barbed wire posts to find the clips -- there are three on each post. Attach a piece of barbed wire to one of the clips and wrap it around the post. Secure the wire with a wire tie to prevent slippage. Run the barbed wire to the next corner post. Attach a wire strainer to the barbed wire and tighten it until the wire is very taut, then clip the wire to the next post. Repeat the process for each corner post until you get back to the first post. Secure the barbed wire to the first corner post with the attached clip. Once you have the wire tightened and secure, clip off the excess. Repeat the entire process for the second and third lengths of barbed wire.